The funeral director took my hand between her palms, looked into my eyes, and murmured I’m sorry for your loss. There were papers to sign, urns to peruse. Did we like a traditional navy with stripes? American flags? Dolphins? The irony of this somber kitsch would not be lost on my artist-father, but of course he wasn’t here to comment. I floated outside and above myself. Nothing below made sense. 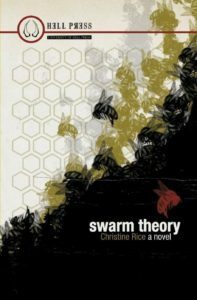 Swarm Theory, Christine Rice’s novel-in-stories, feels something like this; levity bounces against horror, and everything is always coming unmoored. The book’s linked narratives circle around points of impact, with characters reeling in the aftermath. One can imagine a stern god shaking the earth, people flailing for a hand to yank them back to solid ground. A whirlwind of stainless steel mixing bowls, spoons, spatulas, a bag of Gold Medal Flour, a roll of 35-millimeter-film, onions, lemons, and bits of dough orbited him as if he’d become the king of a very odd universe. My folks never acknowledged the chaos swirling around them, maybe because it never touched them. Only me. But I would stand there, dumbly unable to speak, watching the bedlam. By the time it stopped, I’d be drenched by rain, pelted by hail, flattened by their whirlwinds. This unanchored feeling is recurrent throughout Swarm Theory, a character in its own right. Astrid’s mother, Leila, seeks counsel from a longtime acquaintance, a Catholic priest named Maurice. The relationship blossoms into a love affair. Maurice, a man of faith, is also a nonconformist whose noncompliance with the church’s stance on issues such as abortion and homosexuality has raised red flags. He adores Leila – has loved her in secret for sixteen years – and is prepared to leave the priesthood for this woman, whose “moods could swing wildly and were equally intense – tsunami-like, upending. This was it, he’d decided: hold on tight, let it sweep him away, let it fill his lungs and drown him.” Leila and Maurice, compelled to secrecy, meet at a shop on the outskirts of town called the Whoopee Bowl. But even their rendezvous spot resembles a tinderbox primed to blow, a “jumble of junk” where a “storm could spontaneously erupt.” Love has no ballast in such a tempest. And yet no matter how often it gets tossed about, beaten, pummeled, we sense that love will persist, tendriling plantlike towards the sun. In a pivotal chapter called Swarm Theory, Dovey visits Astrid, her lover’s daughter, and is attacked by an Old Testament-worthy hive of bees. Hundreds of stings leave her “lips and cheeks ballooned to giant welts, the skin stretched so tightly that it shone like an overfilled water balloon”. The moment continues along biblical lines as Astrid, who has fantasized about killing her father’s mistresses, pushes Dovey inside the safety of a tool shed and begins scraping away dozens of the embedded stingers. Splayed under daggers of light, Dovey is saint-like, while Astrid, attending to the wounds of the fallen, is redeemed. Swarm Theory turns roles upside down only to pull us back, time and again, to this revelation of empathy. Harry pulled the air horn, which only panicked the dog. It slipped, righted itself, but couldn’t get footing on the icy ties. Harry blasted the horn one last time and the dog leapt in the air just before the train hit. The impact threw the dog ten feet up and out until it landed on the snow and tumbled the rest of the way down the embankment to slide, blood etching its journey, across the frozen ground. Will later returns to the site and transports the wounded animal to a veterinarian. He stands by the dog’s side through the amputation of one of its legs, and dog and man become inseparable. In this scene the animal takes on a totemic quality, becomes not just a salve for Will’s pain, but a symbol of Will’s disfigurement at the hands of life, of his determination to accept his disfigurement and continue living. We all suffer irreversible blows, Swarm Theory reminds us. To fail to acknowledge this common suffering is to become unmoored from our humanity. As that funeral director with the urn catalogue understood, people reach for the grieving not just to comfort them, but to keep them from floating away. Jessie Vail Aufiery is a fiction writer, poet, and translator. She is the World Literature Editor for The Literary Review, and has an MFA from Fairleigh Dickinson University. She lives with her husband and twin daughters in Miami. You can read some of her recent work in issue #2 of jai-alai magazine, Issue 31 of Petite Hound Press, and in the anthology Paris, Etc. : Writing and Illustrations. Find her online at: www.jessievailaufiery.com.